So everyone by now has heard so many rumors about Zelda Wii that it makes us sick to our stomach just imagining the possibilities of truth. As always, the first and second batch really fit well together, but there is no way to really prove the truthfulness of them until E3. Same goes for this new batch, which just came fresh off the email press… oh a good 30 minutes ago. We do have an in-house translator working some angles to get the truth, but as of right now we have no official word on the “validity” of the source. The big thing with these rumors is some of them directly conflict with previous rumors, while at the same time still seeming highly plausible. 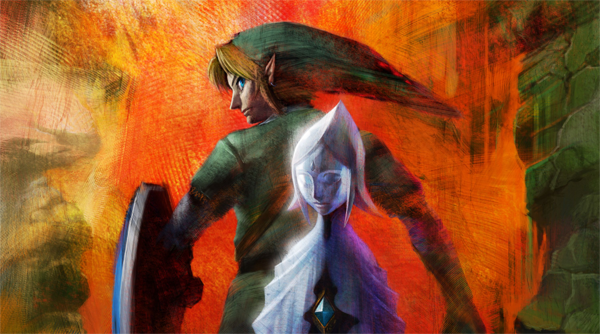 Zelda Wii’s official title is “The Legend of Zelda”. There will be no subtitle. The game tells a story several hundred years before Ocarina of Time.It also answers the question of how the Mastersword came into being. The fairy-like girl plays is a very important character in the game. Her Name is Zordiana. The Hookshot is also in the game and it has new abilities. It will not pull you immediately to the target you aimed. Now it is possible to swing with the Hookshot, like with the Grappling Hook from WW. The Hookshot makes no use of Wii Motion Plus. Sometimes you have to “draw” a specific symbol on a door with your sword, to open it. The Bow-Control is very similar to the Bow-Control in Wii Sports Resort, as the script shows. There are two levels of difficulty. Aonuma put it through. Miyamoto didn’t want to include it.The Normal-Mode for amateurs. The Hero-Mode has no “Super Guide” included and the enemies tougher. The On-Stage Dungeon, which is also playable at E3, isn’t a Dungeon as we know it from the Zelda series. When entering a Dungeon, you will not notice you are in one. It will be a smooth gradation. There will be Dungeons with no Bosses and Bosses with no Dungeon. The “Dungeon” you are able to play at E3 will be an Ice-Level. It will be the frist “Dungeon” in the Game. While we have not yet verified these rumors, rest assured we are working on it. What I will tell you is they come from a German forum, and yes the rumors do actually exist there. We are in the process of contacting the poster of the rumors to get a further source, so we’ll let you know what we find as soon as we know. If it turns up nothing, we WILL release the source site later today. If it turns into something, hopefully we can add some real value to these words. For now, just imagine the possibilities… and remember, we’ll know everything we want to know in just 3 days.